It’s doubtful that the new blood elected to precinct captaincy have enough juice to rid the party once and for all of the inbred leadership of Mark Owens, Russ Joseph, Nan Whaley, Karl Keith etc. The power of the party of patronage is strong with this group. I blame myself for not going out to actively plot and recruit people to take over the party, although I was telling everyone to run for precinct captain back in January. The party reorg meeting, where the vote is taken was moved to a Wednesday, instead of the normal Thursday, to be on Wed. June 6th at 7:30. What they didn’t tell anyone is that they are having a constitution review meeting tomorrow at 9:30. Did they invite all the current ward leaders or members of executive committee? No. (I am both). Did they invite future precinct captains? Nope. I am writing on behalf of Chairman Mark Owens to invite you to participate in the Constitution Committee. This committee is an ad hoc committee that meets generally in concert with Reorganization. 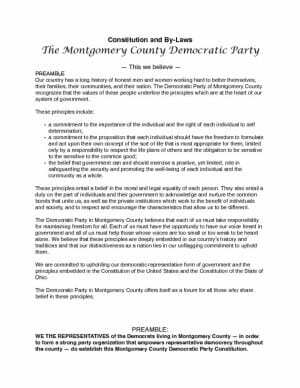 The purpose of the Committee is to review the MCDP Constitution, make sure it remain in compliance with the Ohio Democratic Party Constitution, the DNC Constitution, and Ohio Revised Code – which are all governing bodies that have jurisdiction over the MCDP. If you have questions or concerns about the Constitution Review Committee, or are wondering why I asked you, please feel free to give me a call any time. P.S. (The answer to why will likely include the following reasons. 1. You have been duly elected to the Central Committee. 2. You have expressed interest in the governance of the MCDP. 3. You’ve asked how you can help out the Party, and here is a project that needs attention. One central issue that the June 6 MCDP Reorganization Meeting must deal with is how to build respect and support for the Democratic Party. We must deal with the core reasons that so many Democrats stay home and refuse to vote. We must deal with the fact that the party has lost legitimacy. At the June 6 Meeting, I’m proposing ten changes to the MCDP Constitution. I believe that in order for the Democratic Party to gain respect and support it must address: Its Purpose, Its Structure and Its Legitimacy. I think he doesn’t go far enough. My suggestions are much more draconian- to stop the party of patronage from strangling itself. The reality is, we shouldn’t allow elected officials to also run the party- once they are elected- they are supposed to serve everyone. We also need to stop allowing patronage job holders to be precinct captains- because they vote to pick or prop up their bosses. There is no reason for a central committee and a subset executive committee. I’ve attended both meetings for years- and they are virtually the same. Just like we don’t really need a House Senate and House of Representatives in Ohio- and we could switch to a unicameral system- it’s time to cut the crap and just let the body vote. With the huge cut in precincts due to our population loss about 8 years ago- there aren’t so many seats that we can’t just vote and manage the whole party leadership in one meeting. If this party wasn’t just a friends and family club- we’d have opposition research on every Republican- we’d have an entire machine built to canvas- and keep our data up to date. We’d support ALL Dems who run for office – because we are trying to elect Dems. We’d have a candidate in every race, we’d have a bench of candidates ready to step up. That’s a party I could be proud of. Not endorsing in primaries is only the beginning…. I’ll be there tomorrow at 9:30- if you are a member or future member of the Montgomery County Democratic Party- you should show up too. The committee, as it stands is 4 people. Mark Owens (clerk of courts Dayton, and party chair), Nolan Thomas (prosecutor city of Kettering), Sarah Greathouse (see above) and Mike Bock. Does that sound like a group for change? I challenge you to write an article or attend a meeting where you have something positive to say. I have read a few of your entries. Each and everyone of them that I read are negative and sarcastic. I can’t imagine living in a completely negative world as you appear to do. My mother taught me you get more with honey than vinegar. I think that Idea might work for you. Sometimes you have a good idea but your negative attitude ruins the thought. I know people in the party have invited you to sit down and speak to them to gain an understanding of your concerns. I also invite you to do that. This might help you to approach things in a positive way. You might try this. I like …….. but I think it might work better if we add this……. Good luck! I look forward to a positive comment you at our next meeting in August. I’m assuming D. Owens is David Owens, brother of Party Chairman Mark Owens. Mark is our elected Clerk of Courts, his brother David has a patronage job in the Board of elections. He’s using the “rose colored glasses attack.” If you don’t have something nice to say- say nothing. This site isn’t here to be PR for a community that’s not living up to it’s potential. Our tax dollars aren’t here to keep your friends and family employed. I’ve sat down with people from all over this community. And, one thing is absolutely evident- no one thinks we’re hitting on all cylinders. You want to know what was right about last nights reorg meeting? That the elected precinct captains were actually handed a handbook- right off the bat. That we had assigned seats, that there was actually a process and voting. That’s a huge change from times past. It’s funny- I have no problems talking to Republicans, independents, and progressive dems. They don’t think I’m negative. Just the people who are living in fear of losing their livelihood because of the whim of the voters. There is very little real democracy in the democratic party. No one has the balls to stand up and defy the party- when they get a paycheck from it. That’s why there were only 99 elected people out of 360 possible. Keep shooting the messenger D. Owens. Wait till you see the efforts of http://www.reconstructingdayton.org as we show you how a Board of Elections site should work. But- if you want to have lunch- come on, I’ll even buy. Number is on the site. Wrong assumption, Mr. Estrai. My challenge is still offered. Oops, sorry Debra, wife of Montgomery County Democratic Party Chair Mark Owens. There are plenty of positive posts on this site. You can start working your way back to 2005- there are over 2700 posts.